Tata Steel 2016 Recap: Carlsen makes it five! Magnus Carlsen has matched Vishy Anand’s record of winning the top tournament in Wijk aan Zee five times, and he’s done it twice as fast — taking nine years to his great predecessor’s 18. Magnus completed the task on Sunday with utter professionalism, quickly reaching a position only he could win against Ding Liren, before drawing in 99 moves. That left the door open for Fabiano Caruana to share first place, but Evgeny Tomashevsky slammed it shut with a consolation win. 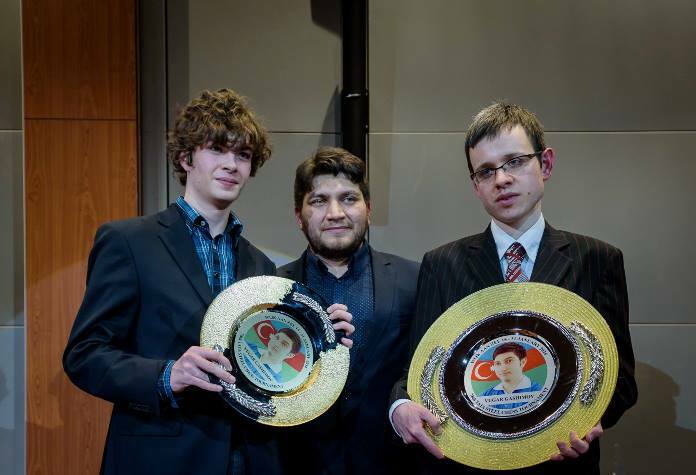 Caruana still took second alongside Ding Liren, while Adhiban won the Challengers. For the last few tournaments it’s mostly about restoring my play to the level it was before… I’m happy that I’m playing decently again and that there is some sense to my play, that it’s not just a mess in every game. When I play well my rating will follow, so I’m not too worried about that. I would if I could! To be fair, there weren’t any particularly brilliant games of mine this year. I focus mostly on the result. I really want to play brilliant games but the result has to come before and I don’t play for brilliancies just for the sake of it. The result from last year gave me confidence that I can do this again. The key is really to get on a streak at some point. It doesn’t really matter when you start winning them. I always think – well, if he doesn’t know what I’m going to play then my opponent certainly doesn’t either, and if I don’t know what I’m going to play then it’s even better! Then there’s no way my opponent can guess it. 16…d3! would have forced a worse ending that Caruana could have good hopes of holding, but a draw wouldn’t be enough to take first place. Instead he went for 16…Qa2! ?, creating chaos in which a Black win couldn’t be ruled out. In the end Tomashevsky defused the pressure and ground out a win, but at least if the same situation occurs in the final round of the Candidates Tournament Fabiano will have had some experience. Yes, he lost today and that cost him a clear second place and a chance at a tie for first, but in general I think he played very, very well. He had an off day against David Navara. He said himself I think in an interview that he felt “lousy” on the day and that I think reflected in his play. Anish had a bit of a weird one, to be honest, but even though I think he’ll be the first one to admit he wasn’t playing very well in this tournament he still finished on +1 and he is one of the most stable players around. I’ll be satisfied if at the end I occupy a place no lower than third. I’ve always thought that having an important tournament like the Candidates is no excuse for playing poorly. I think you can hide some openings, and certainly some openings were hidden here, but it’s still possible to play very well even if you cannot play all your main stuff. I think people like Anish and Sergey Karjakin will not be very happy with their play here. Certainly they didn’t play all their main openings, but they didn’t play so well either. What matters, though, is still what happens in March. This is the first time Hou Yifan has finished joint last in Wijk aan Zee. In 2013 she scored 5.5 points, more than Caruana, L’Ami and Sokolov, while in 2015 she had the same result as this year — 1 win and 4 losses — but finished above Saric, Van Wely and Jobava. Despite the outcome, though, her performance won’t have given Women’s World Champion Mariya Muzychuk any comfort for their upcoming match. Hou Yifan could easily have scored more points, gaining a close to winning position against both Karjakin and So in her first two games, losing a position even Magnus didn’t think he could win in Round 11 and then failing to beat Anish Giri in the final round by a whisker. She looked at home in elite company and breaking into the 2700-club should remain a more important goal than regaining or holding the Women’s World Championship title. As we mentioned in our preview, with key rivals focussed on the Candidates this was a chance for these two players to shine. Ding Liren did, finishing second for a second year in a row and showing signs of maturing as a player. Rather than his incredible 7 wins and 3 losses in 2015 he scored 4 wins and a single loss to Caruana, moving up into the Top 10. Wesley So, meanwhile, won in Round 1 but then drew his next 12 games, with almost nothing to catch the eye. +1 is never a terrible result in a supertournament as strong as this one, but it’s hard to look on it as anything but a missed opportunity. I need to think what’s going wrong with my play in the last tournaments, because I really played much worse than I can, I think, and lost a lot of Elo points. I think yes, the result is very decent, but I can’t say I’m satisfied with my quality of play. Some of the games I played very badly – for instance, yesterday (a loss to Ding Liren). Anyway, it was a lot of fighting chess and I think I’m the player with the most decisive games in the tournament. Overall I would say that I’m satisfied. And finally, Wei Yi. The 16-year-old Chinese prodigy didn’t set the world on fire in Wijk aan Zee, but he defended tenaciously, including against the World Champion, and lost only a single game to Caruana. When you consider Magnus Carlsen had lost four games and won none in Wijk aan Zee at the same age, Wei Yi’s 50% score for joint 7th place begins to look even more impressive. The 79th edition of the Tata Steel Chess Festival has already been confirmed for next year, when the dates will be 13-29 January. That’s good news for India’s Baskaran Adhiban, who won the Challengers to qualify for the Masters. He finished tied for first on 9/13 after surviving two desperate positions in Rounds 11 and 12. You can’t argue that the win was anything but deserved, though. As well as starting like a steamroller with 5 wins in 7 games he managed to beat both of the players he tied for first with: Aleksey Dreev and Eltaj Safarli. Adhiban should prove a welcome addition to the top event on account of his love of sharp chess. So Tata Steel Chess 2016 is over. There's still plenty of chess going on elsewhere, though. The Tradewise Gibraltar Masters has four more rounds to go with the games live here on chess24, while you can also check out the very strong Moscow Open. Perhaps the highlight there will be to see how the prodigies do. Russia’s biggest hopes, 17-year-old Artemiev and 9-year-old Makoveev, are playing, as is the world’s no. 1 prodigy at this moment in time, 2430-rated 11-year-old Abdusattorov from Uzbekistan. Tata Steel 2016, 4: Why the long face?